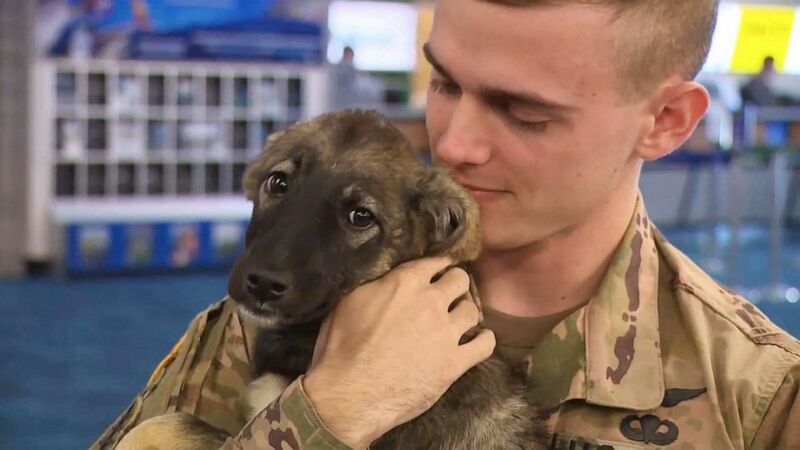 A Syrian puppy arrived to her forever home in Florida Tuesday after reuniting with the Army soldier who rescued her. U.S. Army Spc. 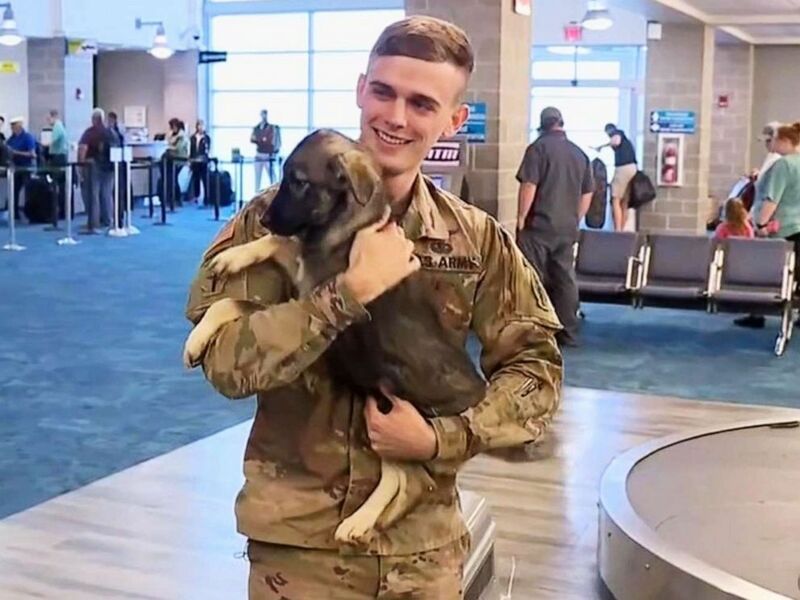 Tyler Mosley of the 7th Special Forces Group cared for Daisy, a 5-month-old German shepherd mix, while he was deployed in Syria last year, the Northwest Florida Daily News reported. The puppy was brought to the Army compound after an explosive ordnance disposal technician found her next to her dead sibling, according to the paper. Mosley described the orphaned puppy as "short, fat and plumpy" and "really loving" when he first met her. He named the dog Daisy because she was "something beautiful out of a bad place," he told ABC Pensacola affiliate WEAR. "She didn't know me, and she just came up to me and was licking me," he told the Northwest Florida Daily News. "I fell in love with her." U.S. Army Specialist Tyler Mosely unites with Daisy who he took in while on deployment in Syria in 2018. While still in Syria, Mosley kept Daisy in an old turkey cage and fed her Vienna sausages and Spam, he said. The two became so attached that Daisy would cry every time he left her. After Mosley returned to the U.S., he reached out to the Society for the Prevention of Cruelty to Animals International for help on adopting her and getting her to the U.S.
"She was in a bad place," Mosley told the newspaper. "I just wanted her to be here so I could give her the love, the life that she wouldn't have had there." After some paperwork and a few hundred dollars, Daisy made her way from Syria to Iraq, where she was treated by a veterinarian, according to the Northwest Florida Daily News. She then flew to Germany and on to New York City until she reached her final destination at the Destin-Fort Walton Beach Airport. Mosley and Daisy had been separated for three months. After airport handlers placed the kennel in front of him, Mosley opened it and sat cross-legged on the ground to greet the pup after her long journey. Daisy's tail wagged as Mosley hugged her and stroked her back. "I missed you," he told her, video from WEAR shows. Mosley then took Daisy to meet his wife, Kelsey, and their cat at home, where a tug-of-war toy was waiting to greet her, he said. "She's gonna get all the love in the world," he told WEAR, beaming in his excitement.